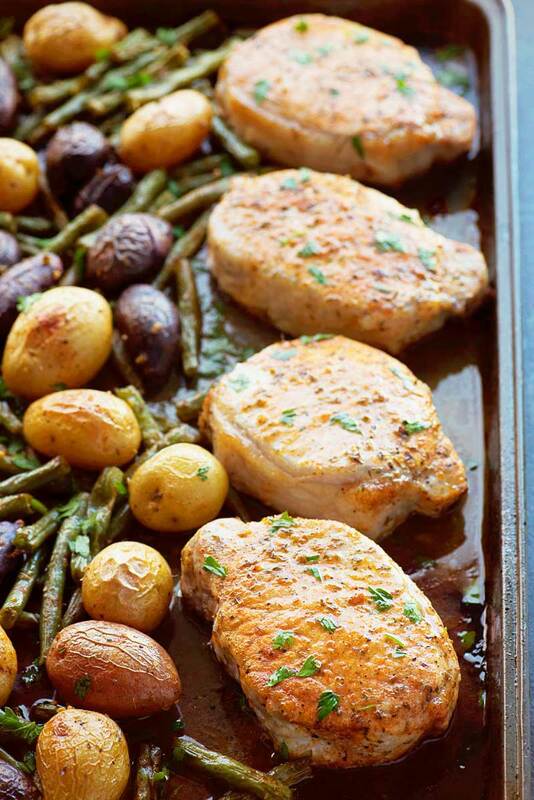 Savory ranch pork chops with a touch of smoked paprika baked on one baking sheet with assorted baby potatoes and green beans. For those of you who regularly read this blog (if that’s you, you’re awesome!) you might have noticed that I’ve been trying to post more dinner recipes lately. I haven’t totally given up on the sweets, of course, but I’m trying to build up my recipe library of delicious dinners. Another reason for all the savory recipes (and probably the most important one) is that in a recent survey I sent my email subscribers, you guys said you wanted more dinners. And not only that, but you wanted quick, easy meals that you can make during the work week. 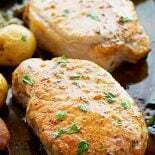 So, today I bring you one of the easiest recipes I’ve ever made: ranch pork chops with potatoes and green beans! I’ve always been a fan of “one pan” meals, but before today, I’d only ever made that style of recipe using a skillet or frying pan. And while those meals are pretty easy to make, they’re not the type you can just “set it and forget it.” When working with a skillet over a burner, you still need to worry about stirring and sticking and a whole bunch of other tasks that ultimately come down to babysitting your food. And I don’t know about you, but I do enough babysitting during my day that I don’t need to worry about keeping my food in check, too. That’s what makes this version of a “one pan” meal so amazing, since you only have to season, arrange it on a baking sheet, and bake it. Seriously, that’s all you have to do. This particular recipe also comes with a built-in side dish. How awesome is that? The cook time is a tad longer than 30 minutes (coming in at about 35-40 minutes) but this dish makes up for that fact seeing as you can completely leave the kitchen while it cooks. So, go ahead and read a book for a bit. Find something good to watch on TV. Whip up that cocktail you’d like to have with dinner. Because dinner will take care of itself and be ready when the buzzer goes off. Preheat oven to 400 F. Coat a large baking sheet with cooking spray and set aside. In a small mixing bowl, mix together ranch salad dressing mix, smoked paprika, oregano, and salt and pepper (to taste) then set aside. 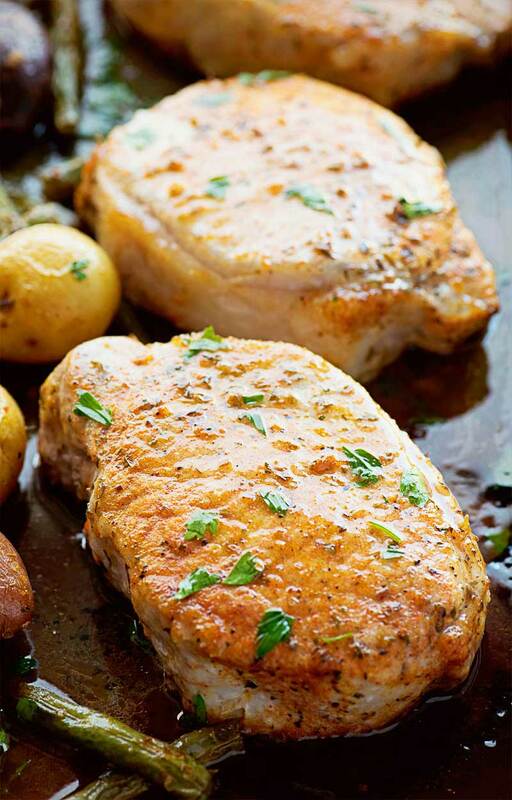 Pour olive oil over pork chops, baby potatoes, and green beans, then toss to coat. Tip: I separate the potatoes and the green beans into separate bowls and place the pork chops on a plate, then add 1 tablespoon of olive oil to each bowl/plate. 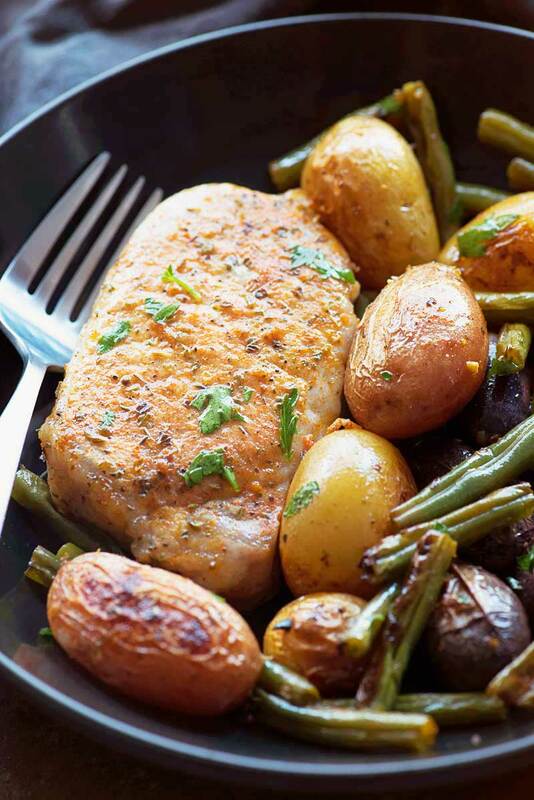 Place pork chops, potatoes, and green beans on prepared baking sheet. Sprinkle genersouly with smoky ranch seasoning, minced garlic, and fresh oregano. Bake in the oven for 35-40 minutes or until the pork chops are cooked through and veggies are tender. Serve immediately with parsley as garnish. Recipe adapted from Jo Cooks. I love one pot meals! This would be the perfect dinner during a busy week. The smoky flavor sounds delicious. LOVE this! Can’t believe I haven’t really made any of these one-pan baked meals. 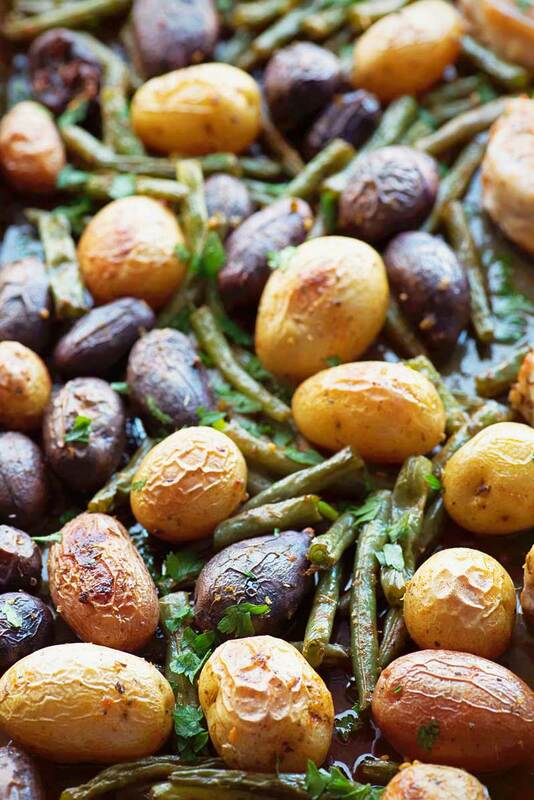 This is a great one to inspire me — love those green beans, BTW! Right?! This was my first one, too, and now I can’t wait to make another! This is a dinner that would go over so well in my home, and I have an easy ranch seasoning that I whip up sometimes. I see this recipe in our future. I love one pan and one pot meals. They make life so much easier on those busy days! And a meal that packs this much flavor with so few ingredients–even better! This looks AMAZING!!! I love that it’s one pan because I HATE WASHING DISHES with a strange passion. Oh, I’m right there with you on the dish issue. One pan is so much easier! Wow. This might just be the single prettiest pork chop I’ve ever seen! AND the whole meal only takes one pan- I think I’m in love! I’ve gotta try this recipe! This looks so good!! I must try it! oohh I just whipped up a batch of ranch seasoning so this is perfect! I’ve used Italian dressing before.